Join Us for the July Membership Drive! At NDEO, we are proud to be a community “Of the Members, By the Members, and For the Members.” When you become a member of NDEO, you are joining a welcoming, diverse, and inclusive community made up of dance educators from 49 states and 29 countries. Our members work in every branch of the dance field, including dance studios and academies, K-12 schools, universities, performing arts organizations, and community-based programs. They teach concert dance, social dance, somatics, and global movement practices, conduct research and publish dance writing, work in related fields such as dance medicine and administration, own dance related businesses, and serve the field as administrators and leaders. We estimate that our members directly reach over half a million students each year, although that number is likely much higher. Though our practices and pedagogies may differ, we are united by our ultimate mission to advance dance education and our vision of a nation that affords every citizen equal access and opportunity to quality dance arts education regardless of gender, age, race or culture, socio-economic status, ability or interest. If you share our mission and vision, we invite you to join our special community of passionate individuals and institutions committed to dance education during our July Membership Drive. NDEO is the largest dance education membership organization in the country, and as such, we partner with other major organizations and institutions to make sure that dance has a voice in national discussions on art and education. By working with groups like the National Coalition for Core Arts Standards (NCCAS), State Education Agency Directors of Arts Education (SEADAE), Arts Education Partnership, and Americans for the Arts, we advocate for dance education on the national level. When you join NDEO, you become an important part of these advocacy efforts and help promote our shared belief in the value of dance education and the impact that dance can have on our world today. 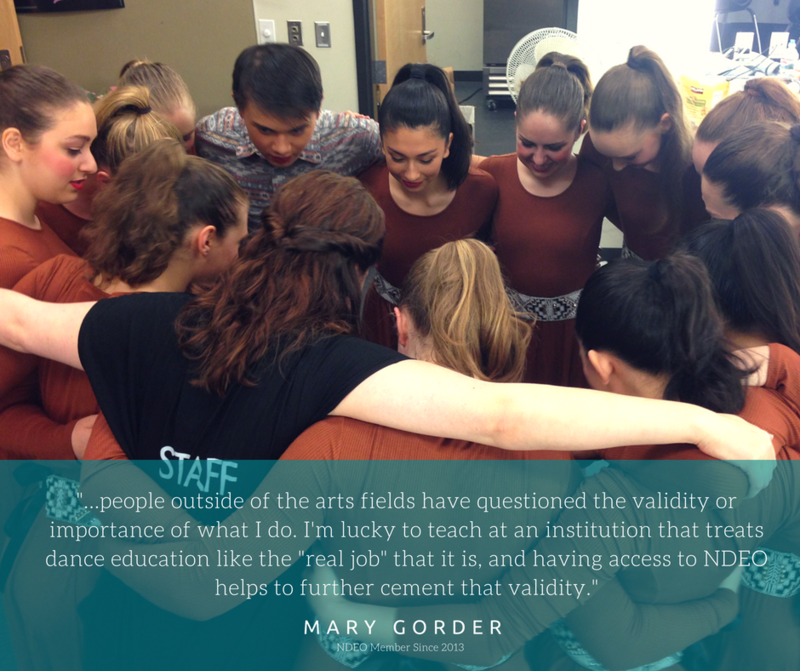 Since 1998, NDEO has been proud to be a leader in the dance education community. As we work to connect the field, build knowledge, and cultivate leadership, we are making a real difference for dance educators and their students across the country and throughout the world. We have helped to shape the field by providing the research, advocacy, professional development, and member services that dance teachers need to provide a quality dance education for their students. We know that dance, when taught by a professional and qualified educator, can have a transformative impact for students. In short, we believe that “It all starts with a dance teacher!” - and we are proud to work with and for the dance education professionals who are making all the difference in the lives of so many. As we mark our twentieth anniversary, we strive to further unite the diverse and thriving field of dance education and welcome all dance educators into our community. We are here to support the amazing work you do for your students and for the field. Your membership not only gives you a voice in the national discussion surrounding dance education, but it also provides the resources and support you need to improve your teaching practice, advance your career, and benefit your students. As a member, you will have access to two of the most respected journals in the field (Journal of Dance Education and Dance Education in Practice), an international support network on the Online Forums, the most extensive dance education database in existence (DELRdi), and conferences, events, and online courses with some of the most respected professionals in the field. During our July Membership Drive, we are offering a discount to all new members who sign up and pay member dues by July 31, 2018. 1.) Go to www.ndeo.org and click on "Sign Up" in the top menu bar. 2.) Fill out the membership application to complete the sign-up process. 3.) Enter the promo code NDEOJuly2018 at checkout to receive 10% off membership dues. 1.) 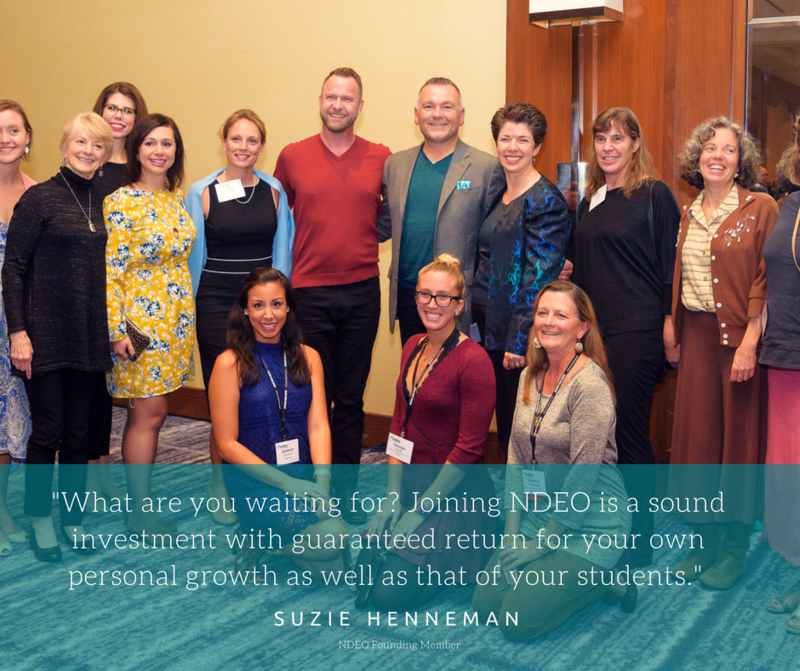 Recruit a friend, a colleague, or a former student to join NDEO. Share the promo code NDEOJuly2018 so that your referrals can take advantage of the10% new member discount. 2.) Ask them to list you as the referrer in the “How did you learn about NDEO?” box on page 3 of the membership sign up. Everyone who is listed as a referrer by a new member who signs up and pays for a membership by July 31, 2018 will receive a 10% discount coupon for their next renewal! Code use is not retroactive to previous membership renewals. 3.) Share the message on social media, using the hashtag #NDEOMembershipMatters. Let others know why NDEO is important to you, and invite them take advantage of the discounted membership above. 4.) Send us your membership story! Let us know why you are an NDEO member by filling out this Member Testimony Form. Selected stories will be shared on the NDEO blog and social media to help all dance educators realize the importance of belonging to our special community. When we come together as a community, united by our shared vision and mission, we can make a difference in the field of dance education and for students nationwide. Will you join us?